Well, the first month of the year is officially over and I feel like it was pretty darn successful! 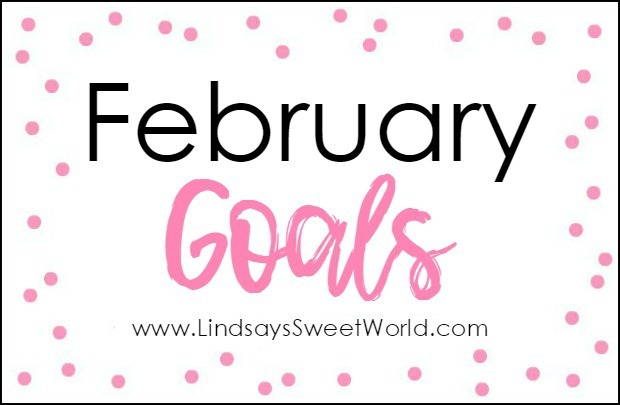 I’m going to share my goals for February today, but first, let’s see how I did with my January goals! I originally used check marks and Xs to indicate my successes and failures but unfortunately they didn't translate across all browsers, so going forward I'm just going to use Y for YES and N for NO to indicate whether or not I accomplished my goals. Y Positivity, worry less, complain less, be kind, patience, relationships. – I think I did a great job on all of this in January! Gotta keep it up! Y Plan all goals for 2019. – Got the whole year planned… you can see my 2019 Goals post here. Y Do my planner prep work for 2019. – Got this done, too! Y Get all to-do lists (daily, weekly, monthly, yearly, etc.) organized and come up with a system to use them to keep my mind clutter free. – Best time I’ve spent! I feel more organized than I ever have in my entire life and I owe it all to my new method of list-making. Y Catch up One Line a Day books for Jacob and Olivia. I’m so behind. – These books are only five years long so Jacob’s is officially done for good and Olivia’s will be done the day before her birthday next month. Makes me a little sad. N Organize List Master (phone app). – I have been using this app for 6-7 years now so it has a lot of stuff in it. I did manage to declutter and organize a lot of it, but I didn’t get the job completely done. N Drink 4 thermoses of water most days. – While I drank a decent amount of water, I didn’t quite get 4 thermoses in per day. During the winter I’m just not as thirsty so I find it harder to get my water in for the day. Y Eat an apple most days. – Ate one pretty much every day Monday through Friday and also on the weekends occasionally. I always feel my best when I eat them! Y Get back to the gym after a three-week break. – Went twice most weeks and once this week. Y Eat less sugar overall. – I have completely ditched any kind of sweets during the day. I’ve been eating a Larabar or Lunabar to curb my afternoon cravings and I’m still sticking to my Halo Top in the evenings instead of regular frozen yogurt. Y Moisturize my neck and chest every day. – And I’m already noticing a difference in that skin. It’s now softer and smoother. Y Get SI joint/piriformis muscle injections for back pain. – Everything went well and the injections have pretty much eliminated my pain most days. Y Visit allergist to discuss steps for maintaining. – Now that we know most of my breathing issues were due to reflux instead of my asthma and everything is under control, I only have to visit him every six months instead of every three! Woot! I will still be doing allergy shots once every three weeks, though. Y Visit GI specialist to discuss steps for maintaining. – I had a great visit with my GI doc and he said that he is going to give me a prescription for a year’s worth of my reflux medicine but I only have to take it as needed. I don’t have to take it every day! And I don’t have to see him again until January 2020! Woo hoooo! Y Continue working on kindness and good manners with the kids. – We have been stressing this a lot this month and it is sticking with Jacob. Olivia still needs work. Lol. Y Create habits of asking to be excused and taking plates to the sink for the kids. – We have literally reminded them of this after every meal and a lot of the time they are remembering to do it on their own now. We’ll keep working on it until it becomes a habit. Y Go to a UGA basketball game and have a day of fun in Athens/Atlanta. – We did this a couple of weekends ago and had a blast. You can see the recap here. Y Have a family game night. – We did this a couple of weekends ago as well. You can see the recap here. N Label everything that they take to school. – Just never took the time to do this. Y Start planning Valentine’s Day. – I purchased cards and small gifts for everyone, decorated the house, and got everything squared away with Jacob’s teacher for their class party since I’m the room mom for his class. Now we just need the kids to pick out what they want to give to their classmates. Y Start planning Olivia’s birthday. – I’m so ahead of the game for this! All of her gifts are purchased, her birthday shirt is purchased, and her cake design is already picked out! Y Book hotel for annual beach trip. – We are staying in 30A again for this June and this year we decided to book a condo in a tiny complex to avoid too much overcrowding on the beach. We’re also going for seven whole nights for the first time ever. I’m so excited I can’t even stand it! June will be here before we know it! N Try a new restaurant. – Never got around to it. Y Get Jacob registered for soccer. – He’s all registered and we should get his team roster and coach assignments in early February! Y Schedule a meeting to discuss cabinet/entertainment center painting. – They're coming on Monday and I'm soooo excited! Y Start planning Olivia’s big girl bedroom. – I’ve gathered ideas and bought a couple of things and now it’s time to put the rest of the plan to action. Y Clean out all Christmas decorations and organize in boxes by zone. – I ended up getting rid of one whole trash bag of stuff, two giant plastic containers of balls, and two shopping bags of other stuff that my Mom wanted. It’s now all organized to perfection. Y Clean out car and wash.
Y Clean out play room. – Got rid of five large trash bags of stuff that included toys, trash, and recycling + got rid of a stack of books, four large toys, and a shopping bag full of the kids’ old clothes. Y Clean out Jacob’s room. Y Clean out Olivia’s room. Y Clean out my closet. – Got rid of two large trash bags of stuff that included 54 clothing items, 2 pairs of shoes, and 1 handbag. Y Start cleaning out office. – Not only did I start cleaning out my office… I finished cleaning out my office! I got rid of two large trash bags of stuff that included old stuff to donate, trash, and recycling + got rid of my old Silhouette and accessories (still trying to sell it), a huge stack of empty DVD cases, and a lamp. Y Photograph, toss, and organize keepsake school papers from first half of school year. Y Back up computer files. Y Do 20 things on Master To-Do list. – I didn’t just do 20 things… I did 50!!!! FIFTY!! However, I also added 14 new items to the list (face palm – haha), so for the sake of decreasing the list by 50% for the year, I’ll have to look at it like I only did 36 things this month. That’s still ah-mazing, though. A few things that I did? Unsubscribed to unnecessary junk emails, got a new frame from IKEA to replace Jacob’s that broke in his room, changed out the pulls on Olivia’s dresser and nightstand, cleared the floor behind my work station in my office, painted my office, got Maui a new bed for my office, put a new light switch plate in my office, organized all of the computer cords behind my desk, reorganized my desk drawers to be more functional, relabeled the toy bins in the play room, organized all old home DVDs, watched all old VHS tapes to make sure I could throw them away, and much more!! Y Plan main content for the entire year – link-ups, posts I do every week, etc. Y Plan all content for January and February. Y Work ahead on blog posts so I’m not writing a post every single day. – I’ve been doing all of my blog posts for the week on Monday and Tuesday most weeks so that way Wednesday through Friday is free and I love it so much! Y Start working on one post for the summer. – I got all pictures organized and edited for a post I’m doing in July! Y Co-host a giveaway on Instagram. – The giveaway I chose to join hasn’t started yet, but I’m all signed up for it, so I’m calling this one a win! Y Share all of my cleaning out and decluttering on Instagram Stories. – I’ve been bombarding all of you pretty much non-stop this month. You can follow along here if you’re not already! Y Pitch to three different brands. – I actually pitched to four! Not too shabby if you ask me! Now for some pictures of my January successes! My car before the clean-out... YIKES. My car after the clean-out! Olivia's dresser pulls after we swapped them out - HEART EYES! My newly painted blush office!!!! Now for my goals for February… keep in mind some of them will be the same from month-to-month as I try to create habits for myself for the year! Plan and have a girls’ play date or dinner. Go to the gym at least 2 times per week. Label everything that they take to school, take two. Finish Valentine’s Day planning and celebrate. Plan Brian’s birthday and celebrate. Finish Olivia’s birthday planning and celebrate. Have two date nights with B.
Organize List Master (phone app), take two. Join Poshmark and start uploading clothes to sell. Get kitchen cabinets and entertainment center painted!!!! EEK! Continue planning and working on Olivia’s big girl bedroom. Clean out kitchen closet under stairs. Clean out side table with kids’ art supplies. Redecorate entertainment center after it’s painted. Clean out game cabinet in front room. Clean out buffet table in dining room. Do 30 things on Master To-Do list. Plan all content for March and April. Complete one post for the summer. Start working on other post ideas for the summer. Pitch to two different brands. Hit 7K followers on Instagram. What a great first month! Now let’s hope I can keep up the momentum in February! Wow. You did great in January! I love following your decluttering on stories. I love how specific you are on your goals list! You really rocked the January list! you amaze me girl! Everything looks great and I know you have such an accomplished feeling getting all this done! Your goals are awesome! WOW! You are amazing. You did so great on everything. Hey we have that knex roller coaster or a similar one and it stopped working! Does your still work? I want to hear more about the instagram giveaway. Did it cost a lot? When it goes up, I would love to know if it helps you gain followers! You knocked it out of the park with your January Goals! I know February will be just as great. Cannot wait to see everything painted...ahhh! HOly cow lady, you have been BUSY! How do you even have enough hours in the day to get all of that done! Impressive! Keep up the good work! You are killing it! I can't wait to see what you do to your entertainment center! What a successful January!! You killed it by starting out the year on a great foot!! You have some great February goals too! Hope you have a wonderful weekend! Girl you are amazing at getting S@hit done! I had a blonde moment and didn't read the caption under Olivia's dresser..you should have seen me scrolling back and forth between the 2 pictures trying to figure out what changed! lol....TGIF for sure! Whoa!! That is amazing! Great job on achieving all those goals. You did a great job with your January goals. Good luck with your February goals! I wish I liked peanut butter! I'm not a huge fan, though. I'll have to try that sugar free peanut butter for Olivia, though, because she would eat PB every single day! I love, love, looove your goal lists. They keep me inspired over here! I cannot wait to see your kitchen cabinets and entertainment all painted! EEK!!! What a great month it's going to be!!! You got 42 out of 46 done! Wow you are my hero. I need to drink more water too. It is an ongoing goal for me. Love that you are still purging and cleaning up!